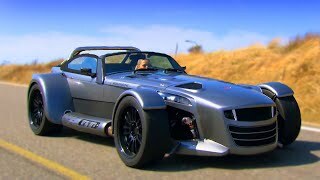 Donkervoort presents the GTO, a new generation of sports car developed in close collaboration with Audi Quattro. 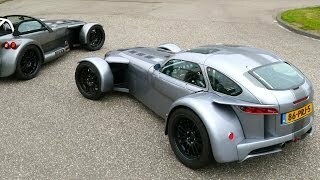 Larger than its predecessors, the Donkervoort GTO 2013 weights 700 kilos and delivers 400 HP of power and 450 Nm of torque. The price of the new GTO is between € 100,000 and € 150,000 excluding taxes. The devotees have been waiting anxiously. Now it’s here! 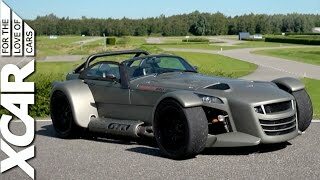 After two and a half years of development Donkervoort Automobielen in Lelystad - in close collaboration with Audi Quattro GmbH - has presented the next generation of open sports cars: the Donkervoort GTO. A combination of beautiful shape, the latest auto techniques and the ultimate experience. With a capacity of 340 to 400 HP and a torque of 450 Nm from about 1600 RPMs. And all this with a total weight of around 700 kilos. Without a doubt one of the fastest sports cars on the European market. And, with the first private preview for Donkervoort Ambassadors from all over Europe, received so enthusiastically that within a few hours approximately half of the first 25 specially designed GTOs were sold. The GTO is clearly a size larger than its predecessors, the closed GT and the open D8 270RS. About 35 centimetres longer and 15 centimetres wider, to be exact. Necessary to accommodate the massive, longitudinally placed, five cylinder 340 hp 2.5 TFSI Audi motor and at the same time realise an astonishing balance in the design. The GTO is therefore a brand-new designed car. Only sharing 5% of the parts with the D8 270RS and about 30% with the much more recent GT. 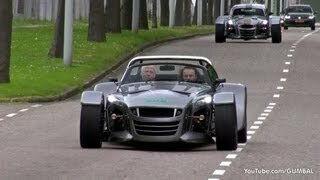 A milestone in the 34-year history of Donkervoort. With techniques directly derived from the aviation and aerospace industry. 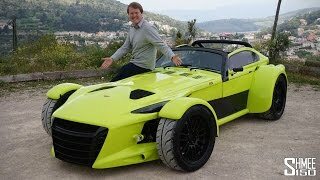 The first in a new generation of Donkervoort automobiles, according to Joop Donkervoort. The reason he also put the chassis number back to ‘0’ starting with the GTO. But this too does not end the renewal of the GTO. By joining the steel tubular frame with large carbon composite panels with glue, a unique combination of (significantly increased) rigidity and ultra-light weight was created. The carriage work also consists completely of carbon composite with as unique invention a one piece door (including integrated hinges), which can withstand a sideways blow of about 1500 kilos and of which the hinges can withstand a force of more than 1100 kilos .... with a total weight of only 980 gramms!! A technique derived from the aviation industry and never before applied in a car. Which is also true for the locking devices of the aluminium bonnet. Derived from the American rocket industry, where low weight, easy operation and smooth finishing - just like at Donkervoort - are of essential importance. In addition the undercarriage of the car has been thoroughly revised, the front axle has been equipped with a totally new anti-roll bar and the rear axle construction - to give the GTO extra stability - has a completely new design. Donkervoort stands for experience, and that term has received a new meaning with the GTO. Tests with the first sample have incontrovertibly proven this. Even though it appears this car is amazingly well manageable. The production of the new car starts in 2012, whereby it is expected that the first specially designed GTOs will be delivered in the summer. The first ‘regular’ versions are expected on the European roads starting in 2013. The price of the new GTO is between € 100,000 and € 150,000 excluding taxes.